We are very proud of DeeDee with her very first litter! 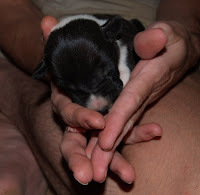 Those are Mark's hands in the puppy pictures, I love the way his hands have such an artistic look to them. Pogo pictures and a surprise from Mrs.Pao! DeeDee is doing well with her eight babies. 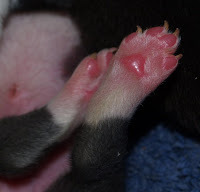 They don't have their eyes open yet but seeing all the pink paws wave in the air is very cute. Pogo was trying to get away from Bunny puppy this morning and fell asleep in the magazine rack again - she barely fits now! What a wonderful surprise was waiting for us at the post office today! Thank you so much Mrs.Pao! I was very confused by the 'New York' address and wasn't sure I was reading the 'from' address right until I opened up the card ;) It's all so CUTE! 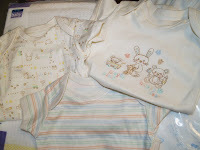 Click picture to enlarge - cute onesies! I'm almost happy enough with my horse pattern now to make a publishable version. 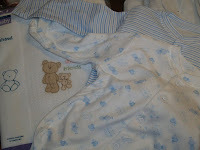 This is the fourth alteration to the original pattern. 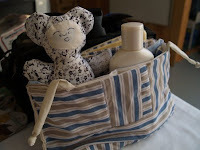 The 'mimsy' or rabbit doll is an extension of the bubblehead babies pattern - which still needs lots of perfection. It was threatening to thunderstorm tonight so Mark set up a tent in one of the downstairs rooms and lined it with paper to bring DeeDee and her babies inside. After she was settled and comfortable again, he took a few pictures of her and her brood. There are actually EIGHT puppies, one of them a little weak but hanging on. There are three mostly black, three mostly white and two of a grey (merle) colour. I feel a little guilty about the next announcement, but this is 'Bunny', a female puppy that was given to us in a parking lot last week. The family's dog had twelve puppies and they couldn't keep feeding them. We definitely don't need another dog, with DeeDee giving birth and me pregnant... We were going to try to give this puppy away at the flea market but well.... she's already a GOOD dog. I've taken to her and she has taken to me more than Pixie ever did to either Mark or me... She's already been 'adopted' by Puck and the outside cat, is being watched over by Misha and playing with Pogo. 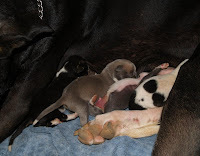 Puppies: We won't disturb DeeDee for a little while, she is pretty nervous normally and we have been worried she would get more nervous during/after the delivery. She is doing awfullly well for doing it all herself, and besides a few little check-ins by Mark (At 30 weeks pregnant I can't crawl under there too well, but I can see a few noses and tails) we'll leave her be unless it rains. Mark says there are seven survivors of three different colors. 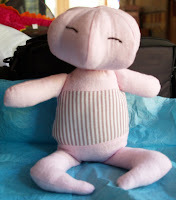 Sewing: Trying out another new pattern, using a new head construction I saw in an internet group on Flickr. I like how bubbly they are! The prototype needed some changes but was a good start! 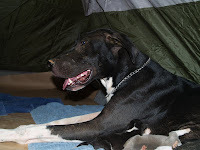 Dee-Dee the Great Dane is giving birth, under the porch outside. We can't see much, although Mark did crawl under there for a moment to make sure she was doing okay. She seems comfortable and there is lots of squeaking. More news later. 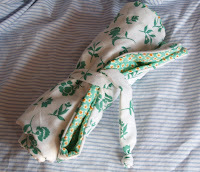 Click here for Instructions and more pictures on how to sew a hooded towel. Baby Update: At nearly thirty weeks I've finally reached that 'Uh-oh really can't bend/roll like that' phase - and sometimes she gets wedged uncomfortably in my right side and I have to lay down for a few minutes to try to coax her to the left. 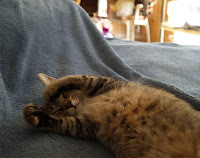 But she is active, especially in the morning and just before bed. Mark said she felt like she was 'dancing' in there last night as we were watching a movie. A while back I picked up a box of fabric at a garage sale and there were some really great patterns in it, particularily these greens. 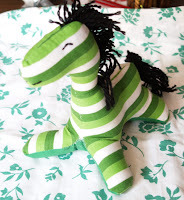 Another little horse in green. Changing Pad in green flowers. This one turned out best of all three of them. I might have jumped the gun a little when I said we had _everything_ collected.. not quite. We still have to get the crib here (it's in the mail) and set up, and then the next thing is the changing table, then bottles/pump etc. And of course, there might be something that I've missed on my list that I've yet to realize. Obsession du Jour already had her changing table set up at 29 weeks... wow, she really was nesting! We visited our county fair yesterday, which is very small compared to the fairs I'm used to in Minnesota. We saw a guy with a tiny baby raccoon he said he had rescued while on the road last week. It was on a leash and very happy, bouncing around and talking to him, obviously he has a talent! It reminded me of a fat kitten with hand-like paws, so cute! There was also a pet monkey someone else had that was bouncy but only towards his owner, he was shy to everyone else. I'm getting round - compare to 22 weeks, and Bazooka is still being an acrobat. Had another doctor check-in today, everything seems to be going fine. Got to ask a few questions about the labor procedures for this doctor as well, and wasn't unhappy with his answers. One of the things I was worried about was a 'time limit' to be in labor before they go to C-section. Some doctors in some hospitals have a time limit set based on convenience, not on how well the labor process is going. I'm glad to hear ours isn't one of those doctors. We've ordered the crib and I still have a few more things to make. Just a few items are left on our list and then its basically waiting and reading more about the actual labor. First time mom, so I'm a little worried about not knowing what is going to happen - but then, that's normal, and I know it's going to be different for everyone. 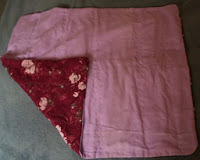 I made a second, better changing pad this weekend, along with some experiments that didn't work out. I did a lot of sleeping at the beginning of the weekend, but have straightened out a little bit since then. I used some of the fancier stitches on the machine to get some practice. This blue fabric had some 'stretch' to it too, just a tiny bit, and it was challenging to work with. I really should iron the flannel before sewing it up - it would make it look a lot better. The dogs found this tiny copperhead (poisonous) snake in the house this weekend. Mark was the brave one who both took the picture and caught it in a jar to dispose of it with. It wasn't too small to strike, and it did try. To get an idea of how tiny this snake is, the black hairs in the bottom right of the picture are dog hairs, and those white spots are spots in the floor pattern! I bought a 'travel changing pad' from Etsy a few weeks ago, but was a little disappointed by the size when it arrived. It was only 12 by 18 inches - and, maybe for a travel pad it isn't that bad, but I wanted to make some bigger ones. I took two of the cloth diapers out of the pack Mark's parents gave us. I laid them down on some purple flannel and cut it about an inch larger on all sides. Then I pinnned them down and stitched them down all around with the sewing machine, about 1/4 to 1/2 inch from the diaper edge. Then I cut another piece of cotton fabric the same size as the flannel backing and sewed them together like I did the burp cloths, just inside the very edge of the diapers, leaving a 2 inch gap on one side for turning inside-out. Turn inside-out, point out the corners with a dowel or unsharpened pencil, and sew the gap shut from the outside. Sew 1/4 inch from the edge all the way around for stabilizing. Then sew a line (I used a decorative curvy line) from the top edge stitch to the bottom edge stitch at equal spaces across the cloth, about 3 to 7 times, for quilting and to give it more stability when you wash it. Finish all thread tails and fold lengthways, then roll up and tie with a ribbon. Update: The burp cloths get used every day. I use them for several things as they are a handy size. They catch milk during breastfeeding, stick under Esme's backside when I'm doing a quick diaper change on the bed or in the bassinet etc.. and they still get used to wipe her mouth when she spits up, which was their original intention ;) The big changing pads are also great (for small baby) as blankets or big soaker pads for when Dad or Grandpa hold her and her diaper leaks. A variety of small pads like these are just great all around, and hold up pretty well in the hot water cycle of the wash. And since they were so cheap and quick to make when one does eventually wear threadbare you can just toss it into the rags and make another during a spare nap. Are we sure there is still a spine in there? I started on iron pills yesterday for 'mild anemia.' They're supposed to give me more energy, willing to try them but yesterday and today I'm actually more tired. Maybe I'm just letting myself give in to being tired now? Anyway, it has been over 100 degrees lately, and that could be a big part of it as well. I'm also up and down several times each night but not for any specific reason... I just wake up after a few hours and then go back to sleep after another hour. These are for Bazooka as well. Tasha included not one but two beautiful tiles! They are made of blue stoneware and her own design. 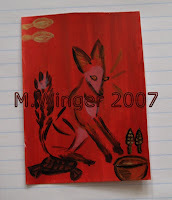 I sent her a picture of my old rabbit tile as an example, and asked her to just make it approximately the same size and her own design. 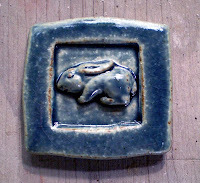 The old rabbit tile.The blue tile on the left is almost _exactly_ the same size as this one, just small enough to comfortably squeeze in the palm of my hand. Her crib, which we will probably order at the end of the month (since it takes two weeks to get in to the store) will be 34 by 20 inches. 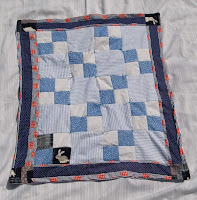 This small quilt can also be useful for covering up her car seat carrier or as a playmat. It isn't extremely heavy - just a layer of flannel in betweeen the top and the bottom. I can always make a bit bigger and/or thicker ones as well. We picked up this nearly new car seat at the flea market.It looks a lot like the one on the shelf at WalMart. We found the instruction sheet for it online at the manufacturer's site and I ordered a new locking-clip for the seat belt on Ebay. If it gets a little cooler tonight maybe I'll take it out to the truck and see how it fits in there. My monster for the 'Mouse or Monster' swap on Swapbot. Thanks for everyone who asked after Spot - he is doing just fine, not acting any different than his usual BOUNCE-y self. He comes in the house, does a few laps in the air conditioning then wants back outside to chase around some more. OH! And.. I'm not the only pregnant female around here. 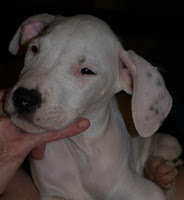 One of the Great Dane girls, Dee-Dee, is going to have puppies next month. Wow - that should be quite a time! We found out she has 'abnormal' anatomy, all of her female parts and a bit that was trying to develop into male, but didn't finish. Since it isn't readily visible, we didn't even know she was any different than her sister Blaze. We don't think her abnormality will get in the way of the puppies being delivered. A lady from Cornell University actually was studying this, and wanted to see her last year, but we couldn't make the trip. 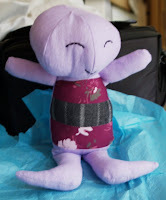 I took yesterday to relax, and played a bit more with the sewing machine. 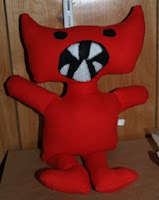 I made a few more burp cloths and then, out of the last bit of the fabric remnant, made a little whatsit toy. Mousebear taking his place in Bazooka's caddy. Early this morning around 3 am the sky was so clear here, I took a little walk up our driveway to see the stars. The Milky Way was bright and detailed. I could also see the Pleiades, and caught one shooting star out of the meteor shower. Last night Blaze was barking panic-like outside and Mark went out to investigate. A few moments later I heard a gunshot as Mark shot the head off a poisonous copperhead snake. It was inside our fence, maybe looking for a cool place to hole up under the house. Spot, our big Great Dane boy, was bitten by it, and that sent Blaze running for help. He seems uncomfortable today, but okay otherwise. The swelling has dispersed today and he is running around like the other dogs - just with a funny looking mouth. UPDATE: The ultrasound test for the bloodclot came out clear, and the swelling is down some. They said to keep an eye on it still, and keep that leg up - but looks okay for now. 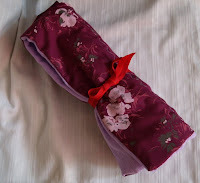 I was recently asked to retell how to make a shikibuton, or Japanese traditional bed. This bed has no frame, and the mattress sits directly on the floor. The bed is folded away into a closet during the day. I've made one before, but it wasn't an 'official' one. I slept on it for three years - and it was difficult to get used to at first, but quite decent after that. You can buy 'official' ones for 300 to 1000.00 U.S. through some shops. There are several different types available. We went to a Mattress factory store and bought a Queen size foam insert that was about 2 inches thick. 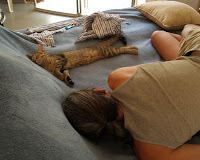 It was like those camping pads you buy that has the wavy surface - but it was for a real mattress and Queen size. We laid it out on the floor and layered COTTON batting on it until it was thick enough. The cotton batting came from a craft store, and we had to piecemeal it. It was important it be cotton so if it collects moisture it dries again. We also used a few thin old blankets to keep the batting down to the foam. Then we cut pieces of cheap upholstery fabric and made a giant 'pillowcase' for it. We sewed the pillowcase on a sewing machine but the entire open end had to be handsewn shut after the sandwich was slid in. Getting the foam/cotton sandwich into the pillowcase and FLAT proved HARD, but it could be done. Next - we bought some thick hard foam from an upholstery shop, the half-plastic stuff. We bought it the same size as the mattress and the shop cut it into three equal pieces. This is to put under the shikibuton on the floor so you can tolerate sleeping on wooden floors with it. I planned to encase each of these pieces in more of the cheap fabric - but never actually got around to it. Each time we folded up the shikibuton up we would place the three pieces underneath it. Usually our blankets folded on top of the shikibuton covered this up - but a nice skirt could have been made for it too with just a few yards of fabric and some elastic. It still cost us nearly 200.00 - but that saved a lot. The real benefit of the 'real' ones is that they probably clean a whole lot better than ours! In Japan people let their shikibuton dry out every once in a while, and store them during the day in closets specially built for their size. We could also fit our 'bed' in the back of a station-wagon or pick-up truck and take it with us wherever we visited to be just as comfortable sleeping at any guest's house. However, the bed was only a few inches off the floor, so in cold weather we didn't get the benefit of the 'heat rises' thing that most people get with a bed 2-3 feet off the floor. They did the glucose test for gestational diabetes today - the sugary syrup you have to drink for that is awful :( I usually don't like too much sugar to start with... The results of that will be in a few days. I'm making more burp cloths and trying some variations on the horse pattern. Our Ebay store has been active and is keeping us busy too! Off to put my feet up and get a few other things done at the same time. Hope you're having a good day! We went and got this yesterday and it is working wonderfully! 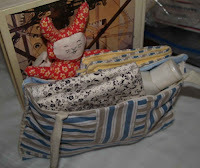 It can help make quite a few things for the baby and speed up toys for the shop. 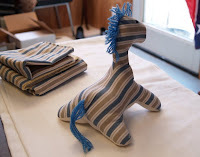 Burp cloths made from old shirting and new flannel, and a little prototype horse / giraffe. We picked up more flannel to make a big stack of burp cloths for Bazooka. 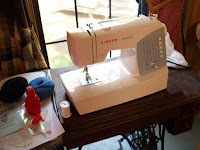 With the sewing machine they whip up in five minutes or less! Even the little horse wasn't too hard on the machine. I've had a bit of a headache since Sunday - watching that closely. Tomorrow we go into the doctor for a checkup. Food Monstrosity - Strong Stomachs Only!